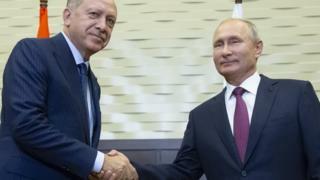 "Radically-minded rebels", including members of Hayat Tahrir al-Sham - a jihadist alliance linked to al-Qaeda that was once known as al-Nusra Front - would also have to leave the zone, Mr Putin added. It was not immediately clear if the zone included Idlib city. Idlib is not controlled by a single group, but rather by a number of rival factions commanding up to 70,000 fighters. The dominant force is HTS, which the UN estimates has 10,000 fighters. If Idlib is taken by the government, it would leave the rebels with a few pockets of territory scattered across the country and effectively signal their military defeat. Why does the Idlib battle matter?